Meggaflash Technologies Ltd., of Ennis, County Clare, Republic of Ireland, is now manufacturing three types of flashbulbs. Their Medium Peak PF200 bulb meets the specifications of the Type 2 bulb formerly manufactured by Sylvania, and their Slow Peak PF300 bulb matches the old Sylvania Type 3 bulb. Meggaflash also offers a Flood PF330 bulb illuminating for over 1.5 seconds for flood flash use with high-speed motion picture film. All three bulbs are in the screw-mount Mazda base, and work with Graflex and Graflite 3-cell and similar flash handles with 7" reflectors. The bulbs are being manufactured now, ensuring a steady supply, and are shipped in a new, modern package. Graflex.Org carried out a test of three PF300 bulbs, and found them to perform as advertised. The PF300 bulb is used at up to 1/25 or 1/30th second, but we chose to use it open shutter to avoid any possible synchronization errors. Due to the intensity of the bulb and the safety factor, we felt an outdoor, inanimate subject was appropriate. Since the guide number of the PF300 bulb at ISO 400 is about 1150, the subject distance had to be at least 50 feet even to give an exposure of f/32. 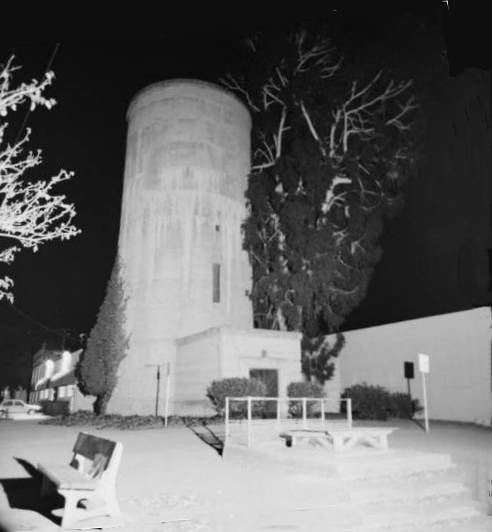 We chose an historic cylindrical concrete water tower in downtown Palo Alto, California, that appears to be about 80 feet tall. We positioned a Pacemaker Speed Graphic about 75 feet away, and used a 75mm Pentax SMC lens from a Pentax 6x7, mounted with a cardboard lens board fashioned for the evening. The lens produced a circular image that didn't quite cover 4x5, but we cropped it to about 6x6cm to produce the image shown at left. To match the suggested guide number of 1150, we chose f/16, and gave normal development to the resulting Ilford FP5 negative. The resulting exposure showed plenty of illumination from the ground up to the top of the tower. For safety, we grounded ourselves to eliminate static electricity, removed the batteries from the Graflite 3-cell flash handle, and screwed the bulb into the base. After centering the bulb in the 7" reflector, we pointed it away and carefully inserted the batteries. Since the Pentax lens has no shutter, we used the T setting on the focal plane shutter, and tripped it just before the flashbulb and tripped it again to close just after.. Since we were using open flash, there was no need to use a synchronization cable, so we positioned the bulb far right of the camera to give interesting shadows. None of the bulbs failed to fire. The plastic safety covering showed the usual crackling and brown spots, but all of the bulbs remained intact afterwards. One bulb did evidence a bit of "guttering" inside for about one second, but this effect seems to be normal in flash bulbs, and we've observed it even in Press 25 bulbs. Meggaflash is producing reliable bulbs for special needs, including large-format outdoor photography and scientific uses such as destructive testing and high speed motion picture photography. Perhaps if there is enough of a market for Press flash bulbs, we can convince them to turn their manufacturing capabilities to making replacements for the GE #5, Press 25, Press 40, and GE #11 and #22 bulbs that we all use. Read the history of Meggaflash for contact information.